It's called the Double Bobble Scarf and the pattern is in Crochet in Color by Kathy Merrick. 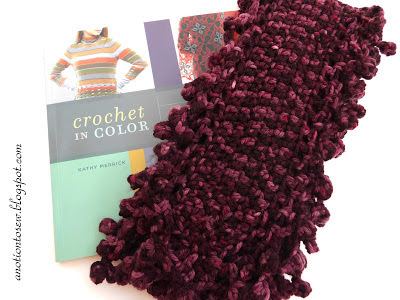 The whole scarf is done in an oval pattern rather than back and forth rows like a lot of crochet scarf patterns are designed. 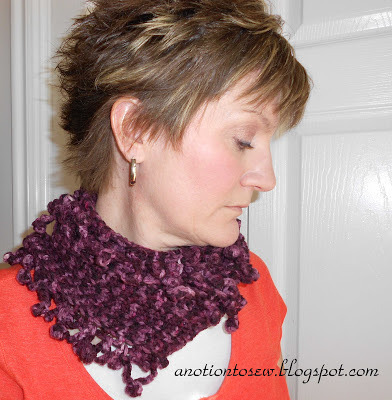 It crochets up rather quickly and I love all those bobbles! 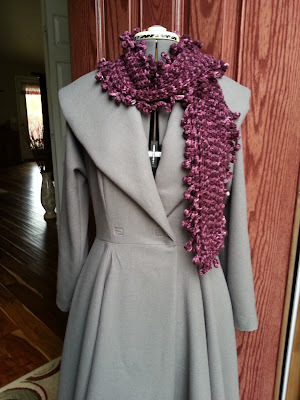 The best thing about this scarf is that it goes beautifully with my new Butterick Coat that is almost complete. My coat is gray wool and the lining is lavender China silk. I should have a full review some time next week. Until then, here's a picture of the almost-finished coat and the Double Bobble Scarf together. We're off on a camping trip this weekend. I've started another crochet project that will keep me busy until I can return home to my sewing machine. Do you have other crafty hobbies that you enjoy when you can't be near your sewing area?